Today is a day eagerly anticipated by many, not the least of who are the publishers Little, Brown and their superstar author. But which author, you wonder? The one whose last few books had true midnight releases, complete with launch parties at bookstores. The one who finished a beloved series and chose to go in an entirely new direction with her writing. 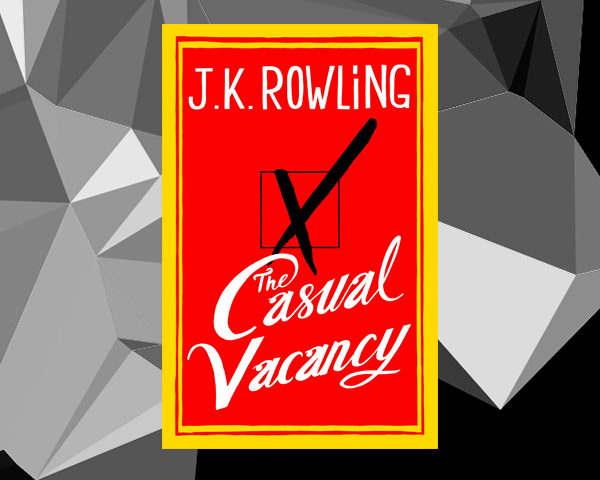 Today is the day that J.K. Rowling’s new book, The Casual Vacancy, is available in bookstores (or on your doorstep if you pre-ordered) for her millions of fans to buy and love. Or buy and hate. Or, I suppose, refuse to buy because the descriptions of the book contain absolutely no mention of wizards teenage or otherwise. And therein lies one of the great tragedies of publishing today. In an age where some authors have followings as rabid as Grateful Dead fans—Chuck Palahniuk comes to mind in addition to Rowling here—many of those readers become so obsessed with a particular style or story that they can’t move on when the author does. In a world where marketing and sales are the bottom lines for most publishing companies instead of wonderful books, authors and their books receive publicity unheard of decades ago. The end result of which is authors becoming, well, names. Which is generally a good thing. When you hear Palahniuk, you think of slightly (or very) disturbing novels with antiheroes for protagonists and society at large as the antagonist. It works, it doesn’t present any problems, unless Palahniuk wakes up one day and decides to write a novel about a group of friends, all good people, who work on wall street and whose quirks include wearing orange ties instead of red ones. But this kind of branding can become a problem when an author has multiple ideas that vary from each other in major ways. Take Audrey Niffenegger for example. When her second novel, Her Fearful Symmetry, came out, it was billed as a novel, “By the author of the best-selling The Time Traveler’s Wife!” Which led, of course, to increased sales. It also led to vitriolic disappointment when Niffenegger didn’t write a second novel about a guy who time travels spontaneously and without control. Which, in case anyone is still angry about, would have been a disaster. For too many, it didn’t matter that Symmetry was a wonderful book, dark and creepy with an air of magic that both spoke to and engendered obsession. Will Rowling suffer the same fate? It’s difficult to say. She headed off many of the issues by saying early on that Harry Potter would get seven books and no more. She disabused fans of the notion that she would be writing something similar right from the start, making it clear that her next project would be completely different. The thing is, I’m going to read the new book. I will admit I’m more inclined to read it because I have loved Rowling in the past. But the novel sounds good regardless. And I think it’s just unfair to compare it to the Potter series. I won’t be ‘looking for echoes’ of anything and if I don’t like the book, it won’t be because it’s different. It would be because I don’t find it well done. But I like Rowling not because of the world she created. I like her because she created it so well, and that isn’t about the idea. It’s about the writer’s talent. Which is why I’m prepared to like this novel and I hope Rowling’s other fans are too.